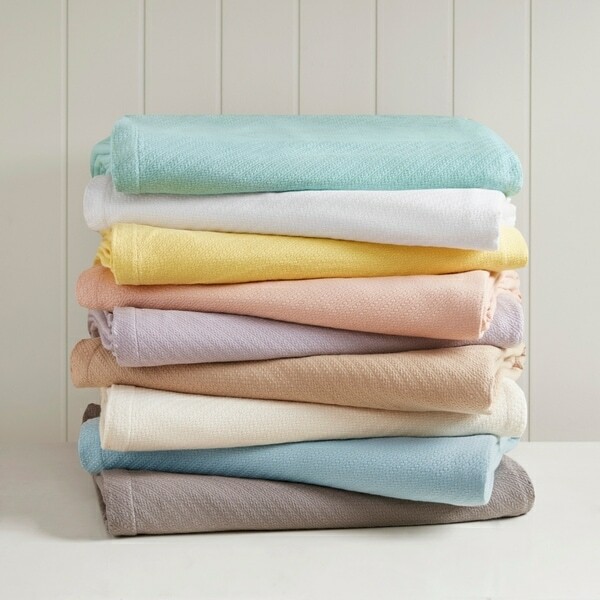 Relish in the lush softness of the Madison Park liquid cotton blanket. Taking the highest quality cotton, we spin it into an incredibly smooth and soft material we call liquid cotton. The ultra-soft material virtually eliminates pilling and snagging, while reducing shrinkage and regulating temperature. Made from cotton, this blanket is machine washable for easy care and perfect for year round use. Dimensions 90.0 In. X 66.0 In. X 0.25 In. Originally purchased a king size blanket for the master bedroom, and loved it so much I purchased the queen size for one of our guest bedrooms. As I washed each blanket before laying out on the beds, I cannot honestly say whether or not they shrank. I do know, however, that each blanket is large enough to tuck at least 8" under the bottom and there is a 9"+ overhang on each side. (This is great, as other full/queen blankets purchased in the past had very little 'extra' to tuck under after washing.) Love the feel and texture...so soft and does not easily snag as most cotton blankets will. This is a medium weight blanket. It has a nice weave that does not snag easily. My only complaint is that it could be 6 inches longer and a couple inches bigger on each side. The queen size just barely tucks in at the foot of the bed and there is a 9 inch drop on each side. The Ivory color is true to the picture. I have bought three of these blankets now in twin size. I bought a white one initially to try it out, and I love the way it washed up and how it feels. It fits the bed nicely and is soft, and closely woven. I liked it so much I bought two more. Another white and a khaki color. The white is a nice bright white, the khaki is more of a golden-tan color. I don't love the khaki color, but it coordinates well with the bedding I had and I didn't want white for that bed. If I need more blankets, I would definitely purchase again. This blanket is a wonderful weight, and washed and dried beautifully. It is nicely sized, hanging about 8 inches or more off each side of our king sized bed. When washed & dried, there was a bit of lint in the dryer trap, but none in the washer. I would expect that for washing a 100% cotton blanket for the first time. This is definitely a great blanket! I did not experience the issues described by some reviewers, especially the lint and the easy snagging. This blanket is a perfect medium weight blanket, generously sized, and soft after washing. It did take some time to dry, as the edges are turned over and hemmed. To me, that is NOT a problem because all of the other qualities of this blanket outweigh that one thing. I received my Premier Comfort Liquid Cotton Blanket quickly and it is very soft but a little heavier than I wish as I am heat sensitive and live in Florida so I won't be able to use this blanket during most of the year but still it is a great cotton blanket. It had some "pulls" when I received it but I kept it anyway as I knew it will get some eventually anyways. I have washed it several times and it still remains very soft and the size has not shrunk too much so it still fits our king size bed. I am happy with my purchase. I wish they had more colors such as beige or green. My husband and I had been sleeping with a super soft 100% polyester blanket over our t-shirt cotton sheet. During the night, we were constantly throwing back the covers because we got too warm. Off/on, all night long. We run our A/C constantly--we live in the Houston area, so it's hot-hot-hot most of the Spring, Summer, and Fall! I read reviews about the Madison Park liquid woven cotton blanket, most of them being about "sleeping cool" -- so I bought one from Overstock (at 2/3 the price from a local store). IT IS AMAZING! Last night was the FIRST night in a very long time that my husband slept through the night! He said he didn't toss the covers off at any time. Sometimes I have to sleep with my feet sticking out to cool off, but last night I don't recall doing that....that was because I also slept through the night. The blanket has just enough weight to give you that comfortable, snug feeling....but it breaths instead of holding the heat in! Now you folks who live up North will probably love the 100% polyester because it holds the heat in. Maybe we'll use it during our short winter here in Texas. In the meantime, I'm going to buy this blanket for both of our guest rooms...I know our grandkids will love it, too! I adore my 'Premier Comfort Liquid Cotton Blanket'. The fiber (100% cotton) quality and manufacturing is superior to other woven blankets I've seen. It's exceedingly soft and luxurious. I love wrapping it around me and snuggling up in my lounge chair with a book or movie. I use it as a bed spread instead of a blanket. I have a double bed, so I bought a queen sized and use it on top. It's perfect. My white on white bedroom needs lots of texture to add interest. This blanket/spread with its woven horizontal stripes adds that texture. The edges are finished very nicely, you'd never think of it as a blanket. The best part of my purchase was the price. I saw the same blanket and brand name on another shopping site for almost $50 more. One thing to consider is the snag factor of a woven blanket. This one does not snag easily like others I purchased. Ive laundered it several times with no problems at all. It is holding up well on top of my bed where it might be sat on or brushed against daily. I highly recommend this product, its a real value. This is a perfect light weight comfy blanket for summer in Texas. Easy to wash and dry and doesn't snag or pill easily. I was looking for an all cotton king size blanket for summer. I've had every type imaginable over the years; expensive, cheap, mid-range. This blanket checks all the right boxes. It is tightly woven with very little chance of snagging it. It is soft right out of the package. The folded & well-stitched edges are identical on all four sides with mitered corners. Although tightly woven the weight is perfect for summer use. I purchased a king to have extra width or length on my queen bed. I don't baby my blankets; they see warm water laundering and a hot dryer -- the shrinkage was minimal and it came out looking great. This is the best blanket I have purchased! Thanks to O.com it was at a fantastic price. I'm buying more! This is a lovely, soft, not-too-heavy cotton blanket, perfect for slightly chillly New England summer nights -- OR for an underlayer on winter nights. We've only had it for a short time, so I'm not sure how well it will wear over time. But it survived the first machine washing beautifully, No pilling yet, no threads pulled. Hoping this wil lbe the case for a long while yet. It looks gorgeous. I purchased this blanket because it was listed as being great for year round comfort. While it was soft and had a nice texture to it, the khaki color had a yellowish mustard tone to it. We have cool colors in our master bedroom with light mocha walls & espresso furniture. This did not work, returned. In addition I was disappointed when I noticed a majority of my orders can no longer be returned with ease online thru o.
I bought this blanket to replace a heavier weight blanket and it's perfect for layering in cold weather. I liked it so much that I ordered another one for the guest bed. Great blanket, feels very luxe to the touch. However, washed this blanket separately with no other items in machine and it came out with two big snags. Bummer. Would have been five starts otherwise. I had to return these blankets. They were just too thin to suit my needs. Otherwise, they seemed to be of quality and were nice looking. I’m not sure what I was expecting with this blanket. I read that liquid cotton was softer and less subject to pilling which was appealing.while it Is the prefect color and exactly the blush shade I was looking for I’m not sure it was worth the price. After washing it, it’s really just another cotton blanket without anything remarkable about it. Looked better in the packaging. Soft, sufficiently substantial and a great variety of colors. I purchased the peach color and am happy with it. Love this blanket. Good quality. I bought white which wasn’t ideal for my dog. But it does wash well. I have had it for few years now and just one or 2 snags caused by dog. This is a nice weight, nicely made blanket, and I really like the yellow color. Wonderful king size blanket. I would order again as a gift. It is light weight, cozy and just the right warmth. Highly recommend this cotton blanket. Purchased this as a gift; therefore I don’t know how well it keeps color and quality after washing it. it is knitted well, it is not light nor heavy. Just good enough for its purpose. 4 stars because the color is darker or dirtier. Not as pritty as in picture. Beautiful color . Holds its color and shape after washing. Highly recommend! We got the blue and it is a lovely color. Nice quality. I would say that this is a medium weight blanket. Love this blanket. Will certainly buy another. Smooth and soft. "Is the regular/queen size large enough for overhang plus tucking in at the end on the queen? I have a queen bed. Wondering if I should get a king size instead?" I always wish I had ordered a King for all my Queen blankets and comforters. "Is the weave stretchy or tightly woven?" "Au contrair"it is so loosely woven that I returned it fearing snags if my dog or my cat walked on it. They're usually not on our bed but even if occasionally was a concern with this blanket. I find it to be pretty tightly woven. Very soft and good quality. It is tightly woven but the threads can be pulled easily. If you have a puppy or a cat I wouldn't buy it. However, I love the blanket. "Can I use this as a furniture cover instead?" This is a light weight blanket. I would not use it as a furniture cover for a couch or chair where you would sit on as it would snag easily given the weave. It's a really soft, lightweight blanket. I would think you would want something heavier to cover furniture. The sheets are perfect for furniture slip covers. That is what I used them for. "which cotton blanket is the heaviest and has the tightest weave"
Hi Blair S. , this is not what I consider a "heavy" blanket. I have other cotton thermal blankets that are heavier. However , the weave is tight enough so you can't see through it. It is tight enough to be embroidered, which I had done for my grandchildren. This blanket is not too heavy and not too light but just right as far as I'm concerned. The weave is very tight and will not snag easily. I have not tried other blankets on this sight to compare fairly but I'm happy with this purchase and would buy another again if needed. I would consider this a tight weave. You can't see through it.. I bought it for a summer blanket but it's a little heaver than I wanted. Hello pposey5, reviews of this blanket do indicate that it does not snag easily. Please let us know if you have additional questions. Thanks for shopping with us! This is a high quality tight weave. I have had no problem with snagging. I suppose if one tries hard you can snag it but with regular use between a sheet and a bedspread it would be very difficult. As for me, I'm glad I made this purchase and expect to be using it for a very long time. I was looking for a blanket that would not pill or snag easily and this one has really held up so far. It's not a loose weave, but it's a weave. It's a classic look which I liked. I use it as an extra blanket in the master bedroom. I do not have pets, but I think the potential to snag is there if you do. It's not a solid material, so if they dig or scratch at it, they would probably hook the loops. "Is the Linen color the same as the "Khaki" color people are referring to in the reviews? I don't see a Khaki in the pictures so did you just change the name to Linen or is that a color that you previously had but no longer do?" Hello Annah, the linen is the third blanket from the bottom. Thank you for shopping with us. Hello kas411, this is mercerized yarn. Thank you for shopping with us! liquid cotton blanket. Taking the highest quality cotton, we spin it into an incredibly smooth and soft material we call liquid cotton. The ultra-soft material virtually eliminates pilling and snagging, while reducing shrinkage and regulating temperature. Made from cotton, this blanket is machine washable for easy care and perfect for year round use.